HAWKS head Lieutenant General Anwa Dramat told MPs in the South African Parliament on September 19th that a suspected rhino poaching kingpin could be nabbed soon, however without going into details. On September 19th the HAWKS announced that 10 people were arrested in four South African provinces in connection with rhino poaching and related crimes. The environmental affairs and home affairs departments, police detectives, crime intelligence, the Forensic Science Laboratory, the National Prosecuting Authority, the Veterinary Council of SA, and Protea Coin Security were involved in the operation. Alleged rhino poaching kingpin Hugo Ras, a former professional hunter and hunting safari operator, who was believed to have managed the syndicate’s activities for nearly five years, was arrested in the Pretoria North Magistrate’s Court while appearing on a separate rhino poaching case; the nine others were arrested simultaneously in Polokwane in Limpopo, Ficksburg in the Free State, Potchefstroom in North West, and in Montana, Mamelodi and Kameeldrift in Gauteng. Some of the arrested are repeat offenders. The police apprehended Hugo’s brother-in-law, Abraham Smit, who allegedly has been on the run for more than 3 years and is wanted by Interpol and FBI; Anton Ras (brother of Hugo), HAWKS Warrant Officer Willie Oosthuizen, Christoffel Scheepers, Joseph Wilkinson, an attorney from Pretoria, Trudie Ras (Hugo’s wife), Jacobus (Bonnie) Steyn, a pilot from Ficksburg, Willem van Jaarsveld and Mandla Magagula. They face 318 charges, including poaching of rhino, selling of rhino horn, racketeering, theft, fraud, and malicious damage to property, money laundering, intimidation, and the illegal possession of firearms. Hugo Ras and several other suspects were ordered to remain in custody until a hearing on October 8th. During the hearing it appeared as if Hugo Ras, Oosthuizen, Magagula and Scheepers may apply for bail when they appear again in November. Syndicate suspect Joseph Wilkinson will appear before the Palm Ridge Magistrates’ Court on October 9th to apply for leave to appeal. Anton Ras’ lawyer said that his client was very ill and will be awaiting medical results before going ahead with nail application. 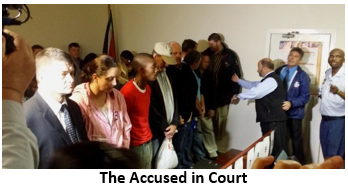 Abraham Smit, Trudie Ras, Bonnie Steyn and Willem van Jaarsveld were denied bail by Pretoria Chief Magistrate Desmond Nair on October 3rd after Magistrate Desmond Nair said the state had “massive evidence”, the suspects may interfere with witnesses, adding that the suspects could be flight risks. The group was allegedly involved in killing 22 rhino and mutilating two others between 2008 and 2012. The state has said it has over 150 witnesses who will lead evidence that the group can be linked to a total of 84 rhino horns that were poached or stolen as well as proving links to international trafficking markets including Vietnam and China. “We have been circling around them for some time, in collaboration with other role players, to enable us to root out their activities,” Lieutenant General Anwa Dramat said.